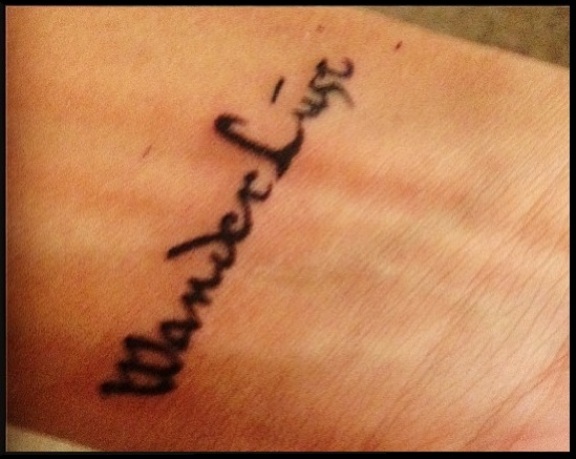 Very few people knew I was getting this done, until I had it permanently stamped on my wrist. The single most obvious question that follows with most people is usually along the lines of ‘What does it mean, and why this?’ (unless of course it’s coming from your disapproving parents, in which case it’s more likely to be on the lines of ‘WHYYYYY DID YOU HAVE TO DO THIS’)! So, to answer that question, I think it is important to understand the etymology of the word in brief; of German origin, the term is seen as a characteristically German predilection for wandering that may be traced back to German Romanticism and the German system of apprenticeship (the journeyman). A modern usage of the word in the English language sways more towards being interpreted as ‘a crave for travel’. It is also interesting in some measure to note the social transition in the perception of the word; wanderlust in the 20th century, according to Robert Ezra Park was considered a trait both anti-social and in opposition of status values; whereas postmodernism considers it as more of a playful, empowering indulgence. Breaking away from the conventional meaning of the term, I believe wanderlust is also about escaping. Wanderlust is also about breaking out of your shackles. Have any of you ever felt like you’re stuck in limbo? Stuck in a place where you never felt like you belong? Stuck with people you never felt like you belong to? The place and the people may be your own and perfectly amazing, good beings but somehow it/they aren’t you – just not something you can relate to. Wanderlust for me, is also about breaking out of these loopy doldrums; about setting yourself free and seek what it is that truly fulfills your calling. The resulting exaltation is both liberating and consuming – and it is this very experience, this very emotion and this very being that I decided to coin as my ‘wanderlust‘ in my own right! What’s yours?